Chicago District Attorney Kim Foxx dropped a bombshell when she decided to not prosecute “Empire” actor Jussie Smollett, who allegedly staged a hoax hate crime blaming Trump supporters. Despite the grand jury’s indictment on 16 felony charges, Smollett is going scot-free, and Police Chief Eddie Johnson says it was “politically motivated.” Now, not only is DA Foxx tied to the Obamas, but she has a shocking link to leftist billionaire George Soros that was just discovered. In a shocking announcement Tuesday, prosecutors dropped all 16 felony charges against the left-wing Hollywood actor, whom police had accused of faking a hate crime in January that he blamed on racist, homophobic white Trump supporters. According to USA TODAY, the district attorney making the call not to prosecute is District Attorney Kim Foxx, who has was approached by Michelle Obama’s close adviser Tina Tchen. Smollett visited the Obama White House many times and was counted as a “friend” by Barack and Michelle. Foxx brokered a back door deal refusing to confer with Police Chief Eddie Johnson, who was livid at the announcement. “Johnson blasted the prosecution for not consulting with cops and hinted the episode could further strain the relationship between the department and prosecutors,” Fox News reports. But Johnson made sure to add, unequivocally: “At the end of the day it was Smollett who committed this hoax.” It’s really rare for a district attorney to decline to prosecute a case with the amount of overwhelming evidence we find in the Smollett case. Yet, the police gather the evidence and make the report to the DA, who then must decide if the case warrants prosecution. Foxx got contacted by Michelle Obama’s close adviser Tina Tchen, who was the former first lady’s chief of staff, early on in the case. Tchen told Foxx the Smollett family would be grateful if the case was turned over to the FBI, taking it away from the Chicago PD who had gathered the overwhelming evidence. “I wanted to give you a call on behalf of Jussie Smollett and family who I know. They have concerns about the investigation,” Tchen wrote in a text sent before 5 a.m. on February 1, seeking to set up a call with Foxx before Tchen left on an 8 a.m. flight to New York. Now, in another bizarre twist, DA Kim Foxx also has ties to leftwing billionaire George Soros. 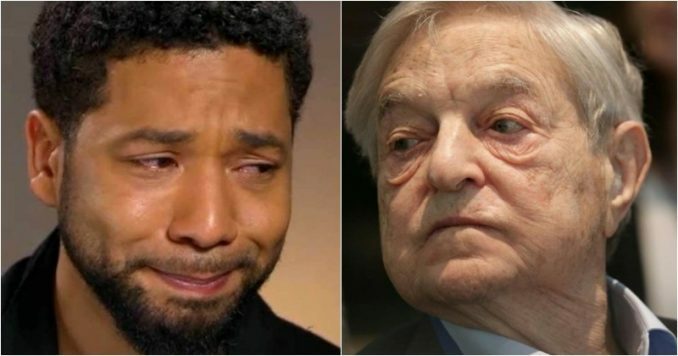 “George Soros donated $408,000 in 2016 to a super PAC that supported Cook County State’s Attorney Kim Foxx, whose office prosecuted — and dropped — the Jussie Smollett case,” Breitbart reports. This entire debacle smell to high heaven, including that DA Foxx also sealed the Smollett case transcripts and expunged his record. But, she decided to keep his $10,000 dollar bond posted. The Trump-hating actor even had the audacity to hold court at a press conference saying he is innocent. It really was a bad acting performance. “Now I’d like nothing more than to just get back to work and move on with my life,” Smollett said. “But make no mistake, I will always continue to fight for the justice, equality and betterment of marginalized people everywhere,” he added. What a load of bullcrap. This guy has no shame. When you have an Obama-proxy calling in favors to the DA who was backed by George Soros, maybe we shouldn’t be too shocked. This is how the elite leftists roll. If Jussie Smollett thinks Americans believe a word he says, he is sadly mistaken. His career is over, but it looks like the Trump-hating actor will be the last person to know.